Either type of pond can be used for aquatic turtles. The advantage of the liner is that you can form it any way that you like, including the ramps that turtles need to get in and out of the water. A disadvantage is that there is a slight chance a turtle’s claws could puncture the liner. 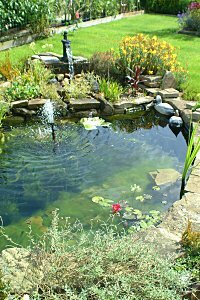 It is also often a little easier to bury a pre-formed pond than to use a liner. Pre-formed ponds cost a little more for the same volume of water. This only becomes prohibitive with ponds over about 150 gallons, where a liner is simply much cheaper. For temporary housing outside, a kiddie pool with something in the center for basking could be used. Cement ponds are also possible but few people make them anymore. They are usually bad for turtles because they can scratch their shells on the cement and then get infections. Obviously, “the larger the better” holds true for any animal’s accommodations but realistically, a pond that is primarily for water turtles should be in the 50 to 500 gallon range. This allows for easier cleaning and makes it easier to locate the turtles. The pond should have a variety of depths with ramps from one depth to another. For daily resting and sunning, there should be areas only a few inches deep so the turtles can be wet but have their heads free to breathe while resting. For swimming, any area about a foot deep suffices. If you plan to keep the turtles outside year round in cooler climates, they should have a spot that is at least two feet deep (or at least a foot below maximum ice depth) for hibernation (see hibernation). Aquatic turtles need to get out of the water. While they can do so on rocks and logs sticking out of the water, they should have the opportunity to feel the earth beneath their feet. Females need a sandy or dirt site to lay their eggs. Sometimes, the turtles want to walk around and investigate. The larger the run, the better it is for the turtles. Due to the effort and costs of fencing, it is more realistic to provide from 1 to 4 feet of ground away from the pond on some or all sides from the water. If you would rather not have a run and fencing, there should be a shear cliff at least a foot high around the water. This could be accomplished with a rock wall or simply not filling the pond anywhere near the top. One can also make a stone overhang of the pond of at least 4 inches and then have the water at least 5 inches below that to keep the turtles inside. It becomes extra important without land to provide logs, rocks, etc. for the turtles to haul out and sun themselves. Many people make an island of rocks, styrofoam, or other materials in the middle of bathtub sized ponds. Fencing is necessary if you do not want your turtles to run away (and they would). It also serves to keep out predators. You may need to even cover the top of the enclosure to keep predators out (chicken wire is fine for that). The fence should be about 2 feet high above ground. For a more accurate determination of the height necessary, it should be 2.5 times the maximum carapace length for the species you are retaining. Another 6 to 10 inches of fencing should be buried underground as most aquatic turtles will dig. Run a board or some other opaque material along the bottom 4 to 6 inches up or so. This prevents the turtles from rubbing on the wire and getting heads or feet stuck in the wire. It also keeps baby turtles in better. Climb barriers may be necessary for turtles that can climb the fence or the corners. Stinkpots and wood turtles are two species known to be able to climb many feet up a fence. An ideal fence would be vinyl or PVC coated hardware cloth (rabbit wire) over a frame of pressure-treated wood. If a gate is installed, be sure to bury a board under it to prevent digging out. Aquatic turtles need places to hide both in and out of the water. These provide places to get away from predators and each other. They also allow the turtles to regulate their temperature by moving to warmer or cooler locations during hot and cold spells. During the summer, they must have an area of shade to get out of the sun. Common hiding places include thick vegetation, large flower pots on their sides, hollow logs, and other similar hideaways. Contrary to some people’s beliefs, water turtles are affected by the same chemicals in water as fish. These include ammonia, nitrite, nitrate (high levels), low oxygen, pesticides, herbicides, etc. Thus, their ponds should have a good filtration system. This is especially true since, just like fish, aquatic turtles do most of their eating and defecation in the water. An especially good filter is needed. While an ordinary pond can do with entire water turnover in two to three hours, a turtle pond should have turnover every half hour or so. Some people would say a turnover every two hours is fine but that really only holds true when there are few turtles in a large, planted pond. I would prefer a larger turnover with turtles in small ponds (under 500 gallons). For example, a 200 gallon pond should have at least a 400 gph pump. There should be a good pre-filter like a sponge or floss. This will need to be cleaned as often as it clogs, perhaps daily. The biological filtration should be adequate to keep ammonia and nitrite levels undetectable. An example setup might be a Pondmaster 700 (700 gph pump) in a 200-400 gallon pond. Remember, a 700 gph pump only pumps at 100 gph if it is old or clogged. If you can change about 10-20% of the water every week or two, that should be adequate if you do not have more than one turtle per 50 gallons or so. It is okay to change up to 50% of the water at one time as long as the temperature is close and proper amounts of de-chlorinator are added. Your post has absolutely surpassed my expectations. Since I started off browsing your blog site I have found out brand-new details and had previous information reinforced. I’ll recommend various folks that i know.